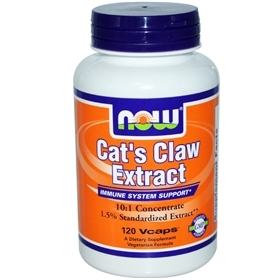 NOW Cat’s Claw Extract contains the highest quality bark of authentic Uncaria tomentosa, an exciting herbal discovery from the Peruvian Rainforest. Also called Uña de Gato, it has been used for hundreds of years by the native Ashanica Indians. Cellulose, Vegetable Polysaccharide (capsule), Stearic Acid (vegetable source) and Magnesium Stearate (vegetable source).